Today we had a play date with a friend, so we decided to make a Valentine to bring him (as we won't be seeing him next week). We wanted something a little different, and I knew that I had seen a teacher that I used to work with use glow sticks in Valentine's Day cards before, so it seemed like a great option for us to try. I cut some heart shapes out of construction paper then let Ethan decorate them however he liked. Ethan enjoyed trying out the stamper and colouring the Valentines with crayons. I cut a couple of slits in the heart for Ethan to put the glow sticks through, which is great for his fine motor control trying to thread them through. Then I wrote on a message for his friend that would suit the theme, so I went for 'You make my heart glow'. 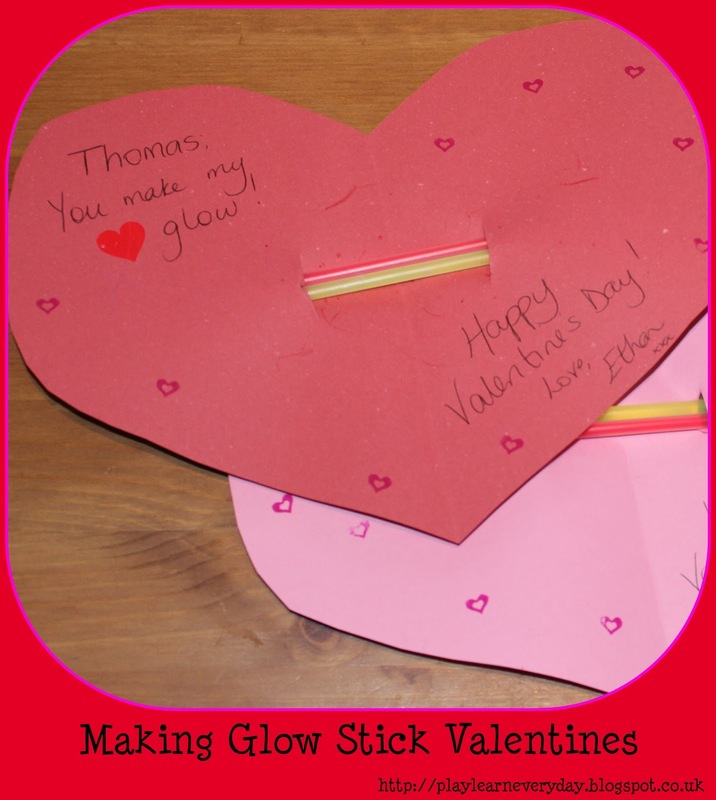 Ethan was able to enrich his Creative Development by decorating the hearts however he liked, and he really had fun being able to decorate them freely without any restrictions.